How can I get involved in church community? 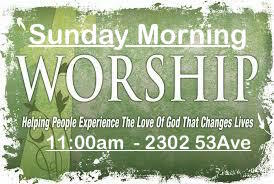 Worship services are at 11:00am on Sundays with contemporary worship and insightful, challenging teaching. You will have a warm welcome as you come through our doors! Every first Sunday of the month The Salvation Army goes into local nursing homes in partnership with the Lloydminster and Area Ministerial and provides Sunday Worship Services for elderly shut-ins. If you are in need of spiritual care, a compassionate ear, or guidance through a happy or difficult time in your life, our staff are available. Phone the office Monday-Thursday mornings, 9am-12pm, Friday Morning 10am-12pm, or Monday-Friday 1pm-3pm for an appointment. Upcoming events - keep checking back for start up dates or contact us to be on our email list for these events! Baby Song - is an exciting Salvation Army program for babies, toddlers and their parents. Baby Song provides an opportunity for: parents to assist their babies in language development and interaction through music; babies to experience developmentally appropriate songs, activities and games; parents to build relationships with other parents; parents to gain parenting tips and information; and the church to reach out into the community. Red Cap - Red Cap is an anger management program geared to ages 8 to 12. Children learn what anger is, and what it is not, how to understand their own anger signs and how to deal with anger through coping and management tools.